I have to tell you about this. Though your scribe has been resisting the general hoohah surrounding the Academy Award for The Artist, charming though the film is and amazing though it may be that a silent film has won the Oscar for best picture, we have to draw your attention to a wonderful new website. The Artistifier takes any YouTube video and turns it into an award-winning silent film. 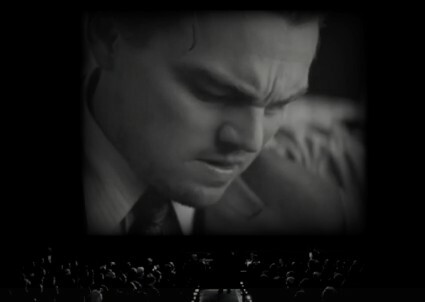 So your video appears in black-and-white, projected on a cinema screen, with your title and director credit, and a caption option so you can add your own intertitles, and then save the film for others to enjoy. All praise to whoever were the bright, quick minds behind this one. It works particularly well with trailers, as in the clever adaptation of Christopher Nolan’s Inception illustrated above. Have a go – and have fun. Fantastic. Or is it fantastique?